During the day Liz Johnson is a marketing manager for a Christian publisher. At night the two-time ACFW Carol Award finalist writes love stories. 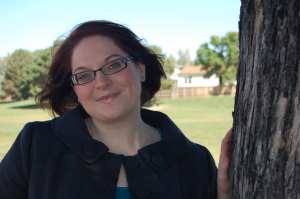 She is the author of seven novels, a New York Times bestselling novella, and a handful of Christmas stories. Her latest book, The Red Door Inn, has just been released by Revell. A graduate of Northern Arizona University in Flagstaff — where she earned a degree in public relations — Liz resides in Nashville, Tennessee. Welcome, Liz! Let’s talk about The Red Door Inn, book one in your Prince Edward Island Dreams series (Revell, March 2016). Please tell us about it. Thank you so much for having me. I’m so delighted to share with you about The Red Door Inn. It’s the story of an old Victorian house along on the north shore of Prince Edward Island and the people it brings to life. Marie is running from a terrible betrayal. Seth is looking for a place to forget his broken heart. And Jack is trying to fulfill promises he made to his late wife. They’re all looking for a safe harbor and a place to belong. 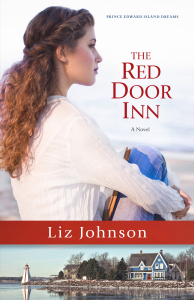 The Red Door Inn may be just what they need, but getting it open in time for the tourist season won’t be easy — especially when personalities clash and hearts get involved. I’ve heard you did personal research on the island for the book. Is that true? That is true! I’ve been to the island four times, and quite honestly I wish I was there right now — even in the middle of winter and knowing that they received 25 feet of snow last year! The island has a tranquility that I’ve never experienced before. I’ve been on relaxing vacations and enjoyed beautiful areas. But PEI has a way of sinking beneath your skin until you can hear the waves clapping and smell the sunshine even after you leave. There’s a peacefulness and a joy there — especially for this introvert. On our first trip to the island in 2010, my mom and I ended up on a little two-lane road along the north shore, and we saw this enormous house on a cliff overlooking the ocean. It was gorgeous. Just like a castle. So we stopped in the middle of the road — it was okay because we were the only people for miles — and took pictures. They call it The Gentle Island for a reason, and I tried to infuse some of that stillness into my book. Prince Edward Island has a way of sinking beneath your skin … you can smell the sunshine even after you leave. Great novels almost always have a plot twist that makes the story better. Have you ever experienced a real life “plot twist” that made your life better? Yes! I was twenty-five and had just started my dream job as a publicist for a small Christian book publisher in Oregon. Since I was thirteen, I had wanted to work in Christian publishing and work on books like the ones I loved to stay up late reading. So with all the excitement of a dozen years of anticipation, I packed up my life in Arizona and made my way to Oregon and began to set up a new life. And then the company I was working for was sold. Talk about a “plot twist.” I had two months of uncertainty — would I be offered a job with the new company? Would I have to move again? Finally I was offered a job, but it meant I had to move to Colorado Springs. I’d been in Oregon just six months when I had to pack up my life and start all over again. It wasn’t at all what I anticipated, but that move brought me some of the best friends I’ve ever known. And the connections I made in Colorado opened the door for another move four years later. This time to Nashville and the opportunity to work with an author I’d admired for fifteen years. My life has been much more exciting than I ever expected it to be. It was an excellent plot twist, and I’m grateful to have had it. Those who “create” usually tap into a personal “toolbox” of elements to define their style. For example, a painter might use color, light, and/or shadows in s certain way to “sign” his work. A musician might use syncopation, key changes, and/or vocal intonation to set herself apart. What two or three elements most define who you are as a storyteller? I’m at romantic at heart, and I think that finds a way into every book I write. And I don’t just mean that I’m an idealist or that I write about love — although those things are true. Every one of my stories is at its heart a story about love. But I also think that romantics feel things very deeply, and I always have a character or two who feels all the things. All the time. But I’m not a fan of melodrama, so I try to cut the tension with shades of humor. I don’t usually write laugh-out-loud funny scenes, but I love a character who lifts others spirits and always try to bring them out when the time is right. I’ve always loved the parable of the talents in Matthew 25, where a master is going on a journey and gives his three servants some money. The first two take their money and invest and trade with it until they each double what they’d been given. The third hides it in the ground and makes the master very angry. I take it as a personal challenge to use the gifts I’ve been given as well as I can. I love how Jesus begins by saying how the man gave to his servants “each according to his ability.” I’m reminded that like a good master, Jesus knows my personality and skills, and He’s given me talents and gifts according to my abilities. I’m not called to use them beyond what I’m able — maybe I’ll never sell a zillion books or write brilliant poetry — but I am charged with using what skills I have. God has given me just the right gifts, so I need to be faithful to make use of them. In the end of the parable, the master takes the money away from the third servant because he has hidden it instead of using it. I’d much rather hear “well done, good and faithful servant” as the first two heard. The beginning of a new year is a time when we often set new goals. If you knew you couldn’t fail, what new goal or dream would you pursue this year? Thanks, Liz! It’s great to have you back at Divine Detour. Thanks for having me, Kathy! It’s always a treat! For more information about Liz, visit her website or follow her on Facebook or Twitter. Liz, nice learning about you and your writing and publishing career! Great interview. Though not PEI, but close, I know what you mean about that area’s enchantment– my husband and I fell in love with Nova Scotia when we visited 16 years ago. I’d move there if I could. Elaine, I have to admit… given the opportunity I would move south to a warmer island, but I’d love to hear more about your fascination with Nova Scotia! I hope all is well in your busy, busy world right now!